Importing pre-existing, fixed-format network files. Importing pre-existing, unformatted text or Excel files. Importing data from from public databases. Creating an empty network and manually adding nodes and edges. Network files can be specified in any of the formats described in the Supported Network Formats section. 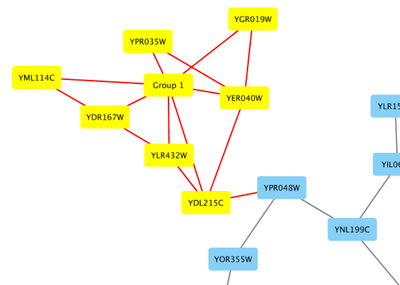 Networks are imported into Cytoscape via File → Import. The network file can either be located directly on the local computer, or found on a remote computer (in which case it will be referenced with a URL). In order to load a network from a local file you can select File → Import → Network from File… or click on on the tool bar. Choose the correct file in the file chooser dialog and press Open. Some sample network files of different types have been included in the sampleData folder in Cytoscape. After you choose a network file, another dialog will pop up. Here, you can choose either to create a new network collection for the new network, or load the new network into an existing network collection. When you choose the latter, make sure to choose the right mapping column to map the new network to the existing network collection. Alternatively, you can simply drag and drop a network file from the desktop into the Network list (Control Panel), rather than selecting the file from the menu option. Network files in SIF, GML, and XGMML formats may also be loaded directly from the command line using the -N option. To load a network from a remote file, you can select File → Import → Network from URL…. In the import network dialog, insert the appropriate URL, either manually or using URL bookmarks. Bookmarked URLs can be accessed by clicking on the arrow to the right of the text field (see the Bookmark Manager in Preferences for more details on bookmarks). Also, you can drag and drop links from a web browser to the URL text box. Once a URL has been specified, click on the OK button to load the network. Another issue for network import is the presence of firewalls, which can affect which files are accessible to a computer. To work around this problem, Cytoscape supports the use of proxy servers. To configure a proxy server, go to Edit → Preferences → Proxy Settings…. This is further described in the Preferences section. 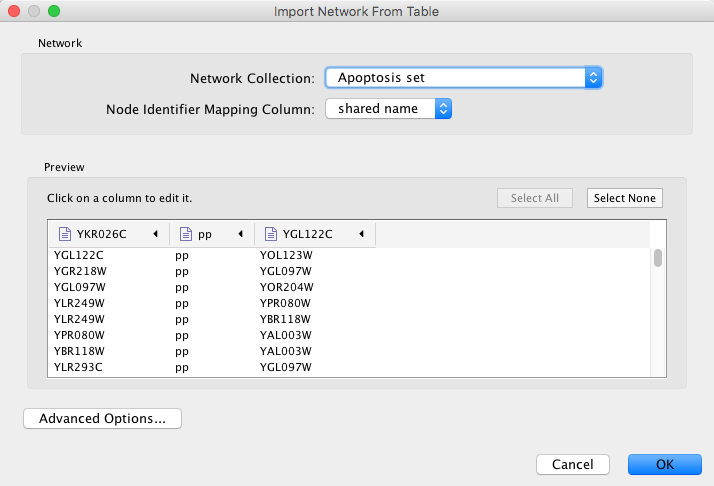 Cytoscape supports the import of networks from delimited text files and Excel workbooks using File → Import → Network from File…. An interactive GUI allows users to specify parsing options for specified files. The screen provides a preview that shows how the file will be parsed given the current configuration. As the configuration changes, the preview updates automatically. In addition to specifying how the file will be parsed, the user must also choose the columns that represent the source and target nodes as well as an optional edge interaction type. For detailed instructions, see Basic Operations below. This data file is a tab-delimited text file and contains network data (interactions), edge data, and node data. To import network and edge data from this table, choose Unique ID A as source, Unique ID B as target, and Interactor types as interaction type. Next, turn off columns used for node data (Alternative ID A, species B, etc.). Other columns can be imported as edge data. The network import function cannot import node table columns - only edge table columns. To import node table columns from this table, please see the Node and Edge Column Data section of this manual. Note (1): This data is taken from the A merged human interactome datasets by Andrew Garrow, Yeyejide Adeleye and Guy Warner (Unilever, Safety and Environmental Assurance Center, 12 October 2006). Actual data files are available at http://wiki.cytoscape.org/Data_Sets/. Select File → Import → Network from File… or click on on the tool bar. Select a table file in the file chooser dialog. (Optional) Define edge table columns, if applicable. 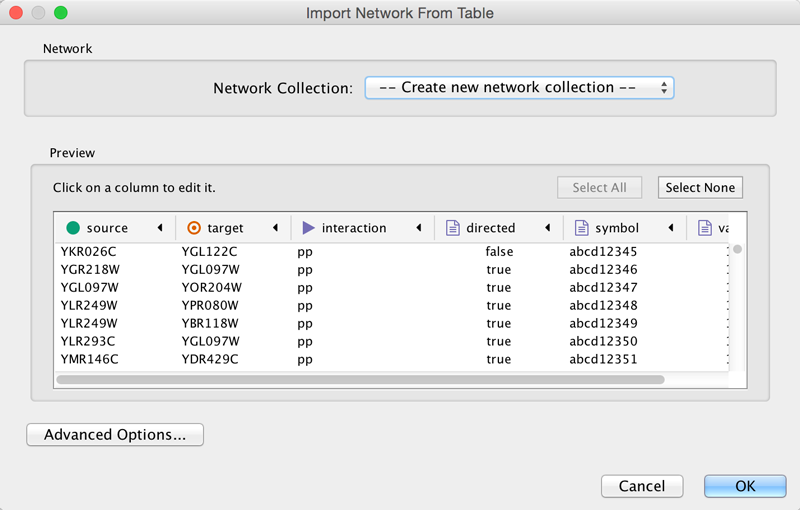 Network table files can have edge table columns in addition to network data. 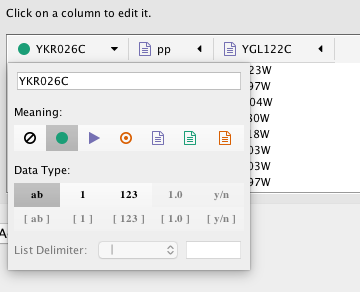 Enable/Disable Table Columns: You can enable/disable column data by selecting the [attachment:disablecolumn.png] symbol in the column editor. 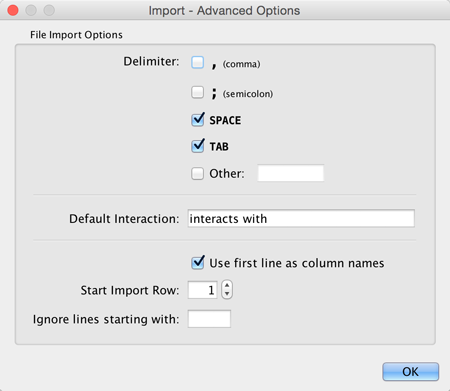 Change Column Name and Data Types: You can also modify the column name and data type in the column editor. For more detail, see Modify Column Name/Type below. The table import feature supports lists of nodes without edges. If you select only a source column, it creates a network without interactions. This feature is useful with the node expansion function available from some web service clients. Please read the section Importing Networks from External Database for more detail. You can select several options by clicking the Advanced Options button in the main import interface. Delimiter: You can select multiple delimiters for text tables. By default, Tab and Space are selected as delimiters. Transfer first line as column names: Selecting this option will cause all edge columns to be named according to the first data entry in that column. Start Import Row: Set which row of the table to begin importing data from. For example, if you want to skip the first 3 rows in the file, set 4 for this option. Ignore lines starting with: Rows starting with this character will not be imported. This option can be used to skip comment lines in text files. Column names and data types can be modified here. Modify Column Name - just enter a new column name. Cytoscape has a basic data type detection function that automatically suggests the column data type according to its entries. This can be overridden by selecting the appropriate data type from the radio buttons provided. For lists, a global delimiter must be specified (i.e., all cells in the table must use the same delimiter). Cytoscape allows you to import networks from public databases. Users can access various kinds of databases through this function, under File → Import → Network from Public Databases…. A Search bar is also available at the top of the Network panel in the Control Panel. From the search bar, you can direclty access several public databases. PSICQUIC: Standard web service for biological interaction data sets. The full list of PSICQUIC-compatible databases is available here. PSICQUIC is available from the Search bar. Pathway Commons: Integrated data from pathway and network resources. The full list of supposrted resources is available here. Pathway Commons is available from File → Import → Network → Public Databases…. STITCH and STRING: STITCH is a database of known and predicted interactions between chemicals and proteins. STRING is a database of known and predicted protein-protein interactions. STITCH and STRING are available from the Search bar and from File → Import → Network → Public Databases…. 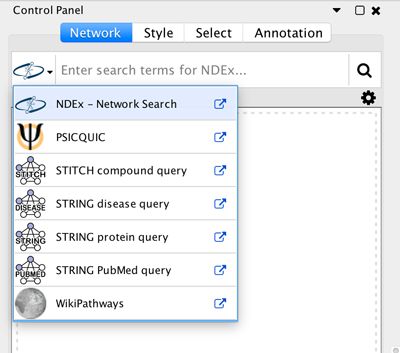 NDEx: The Network Data Exchange (NDEx) Project provides an open-source framework where scientists and organizations can share, store, manipulate, and publish biological network knowledge. NDEx is available from the Search bar. In the Search bar, select NDEx from the drop-down menu and type in one or more search terms, such as BRCA1. 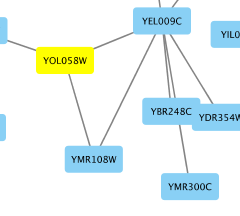 In the CyNDEx-2 Browser dialog, click a network’s Import button to load it into Cytoscape and visualize it. When you have finished loading networks, dismiss the dialog box. 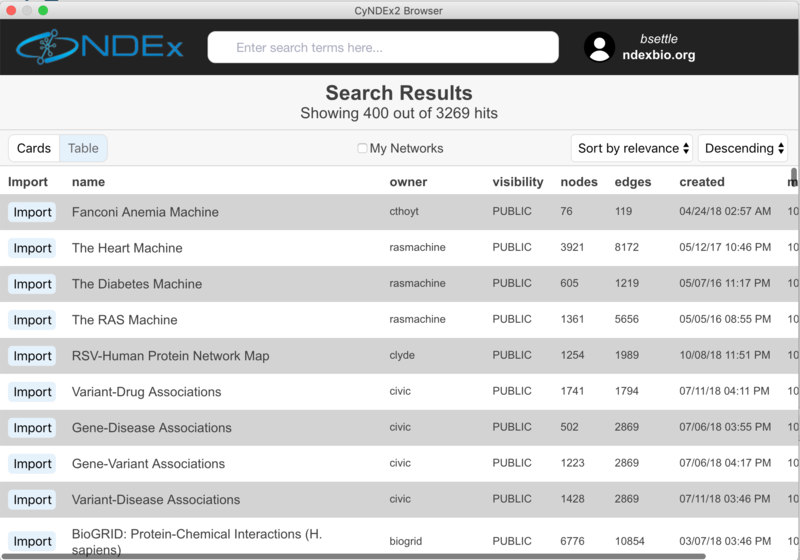 CyNDEx-2, like NDEx, uses standard Lucene Syntax as its network search language. For additional information, see Searching Networks in NDEx. More information about CyNDEx-2, see the CyNDEx-2 App Store page. 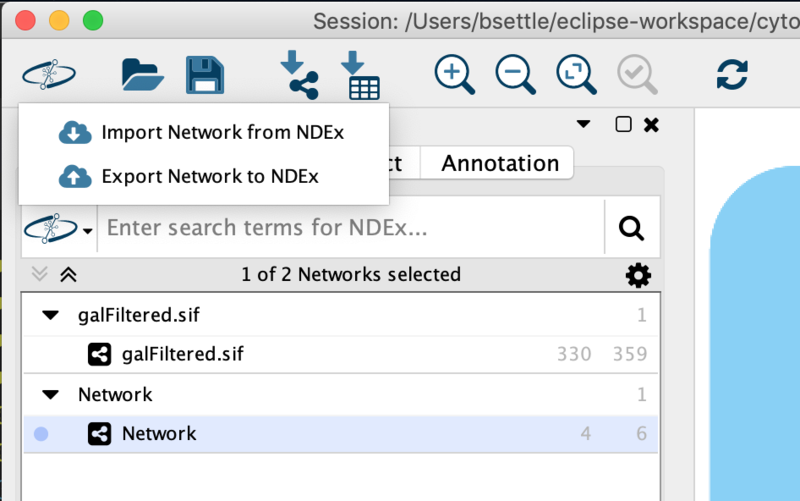 Note that you can save networks back to the NDEx database by using Export options. It is also possible to access the NDEx browse and save dialogs via the NDEx button in the main Cytoscape toolbar, which will display two menu actions on click. A new, empty network can also be created and nodes and edges manually added. To create an empty network, go to File → New Network → Empty, and then manually add network components by right clicking on the network canvas or on a node. You can edit an existing network using the same process. To add a new node, right-click on an empty space of the network view panel. Select Add → Node item from the pop-up menu. To add an edge to connect nodes, right-click on the source node. Select Edit → Add Edge from the pop-up menu. Next, click on the target node. The Images below show the two steps for drawing an edge between two nodes. You can abort the drawing of the edge by pressing Esc key. 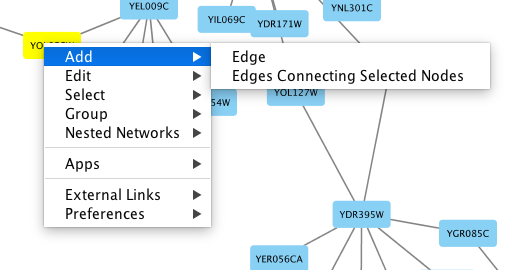 You can also select two or more nodes to connect and in the right-click menu select Add → Edges Connecting Selected Nodes to create edges connecting all selected nodes. You can delete nodes and edges by selecting a number of nodes and edges, then selecting Edit → Cut. You can also delete selected nodes and edges from the Edit menu, under Edit → Delete Selected Nodes and Edges…. You can recover any nodes and edges deleted from a network by going to Edit → Undo. Any number of nodes can be grouped together and displayed as either one group node or as the individual nodes. To create a group, select two or more nodes and right-click to select Group → Group Selected Nodes. 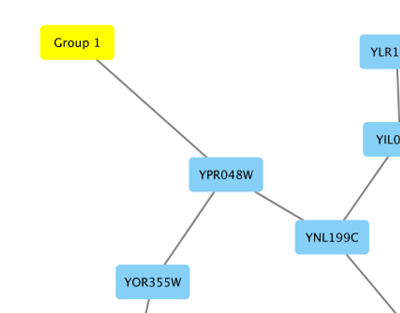 You will be prompted to select a name for the group node. Once a group is created, you can use the right-click menu to collapse or expand the group. You can also quickly collapse/expand a group by double-clicking on the group node or any of its children to toggle back and forth. The appearance and behavior of grouped nodes depends on the group settings in effect when the group is created. Settings can be managed for the entire Cytoscape session (via Edit → Preferences → Group Preferences…) or for a specific group (right-click Preferences → Group Preferences…). Annotations in the form of text, images or shapes can be added to the network canvas by right-clicking anywhere on the canvas and selecting one of the Annotation choices in the Add menu. You can add an image of your own, choose from a shapes library or add either plain or bounded text. Shapes and text are customizable and any added annotations can be edited from the right-click context menu.